For any new players to Where on (Google) Earth, simply post latitude and longitude or a description of the location in the comments. Even better, write something about the geography or geology. If you win, you get to host the next one. I think it's not too hard to find, so I'll invoke Schott's Rule, i.e. former winners have to wait 1 hour for each WoGE they got right. 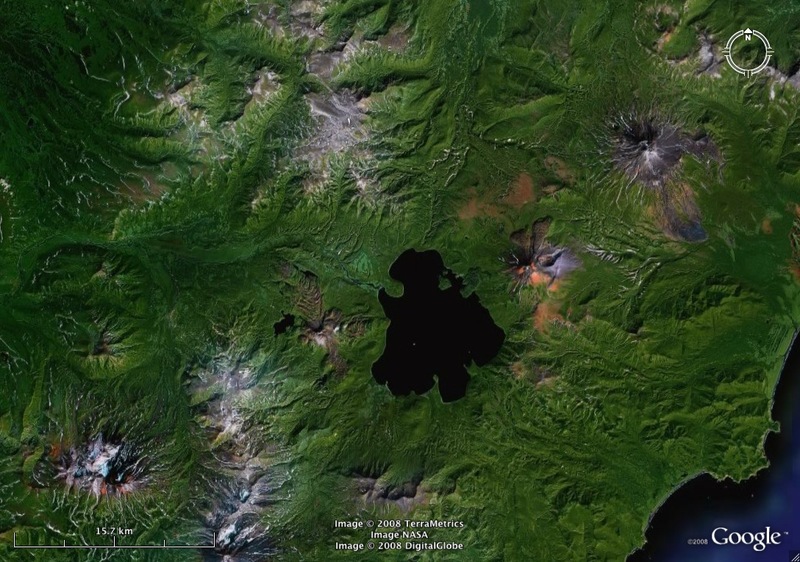 Well, this one was easy to find indeed: 51.5N - 157.0E, southern Kamchatka. The picture features several stratovolcanoes (Zheltovsky, Ilynsky, Diky Greben, Koshelev, Kambalny) and the Kurile Lake (hosted in a large caldera) , all formed in the magmatic arc of in the northeastern Pacific subduction zone. Yes, that's right. We're looking forward to your next WoGE! WoGE #132 is posted, enjoy!